Composite beams are normally hot rolled or fabricated steel sections that act compositely with the slab. The composite interaction is achieved by the attachment of shear connectors to the top flange of the beam. These connectors generally take the form of headed studs. The composite action increases the load carrying capacity and stiffness of the beam by factors of up to 2 and 3.5 respectively. It is normally designed to be unpropped during construction, and must be sized to support the self-weight of the slab, and other construction loads, in their non-composite state. 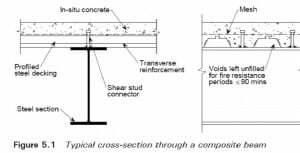 Size of the steel section is governed by serviceability considerations because composite beams tend to be used for long span applications. Check that beam deflections during construction will not lead to significant additional concrete loads (due to ponding) that have not been allowed for in the design.The bending resistance of the section is normally evaluated using ‘plastic’ principles The plastic moment resistance is calculated using idealized rectangular stress Blocks. 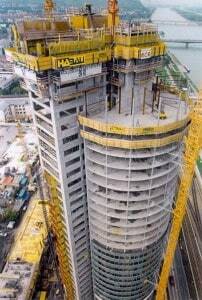 It is assumed that stresses of fyd and 0.85 fcd can be achieved in the steel and concrete respectively. Composite beams are generally shallower (for any given span and loading) than non-composite beams, and they are used commonly in long span applications. 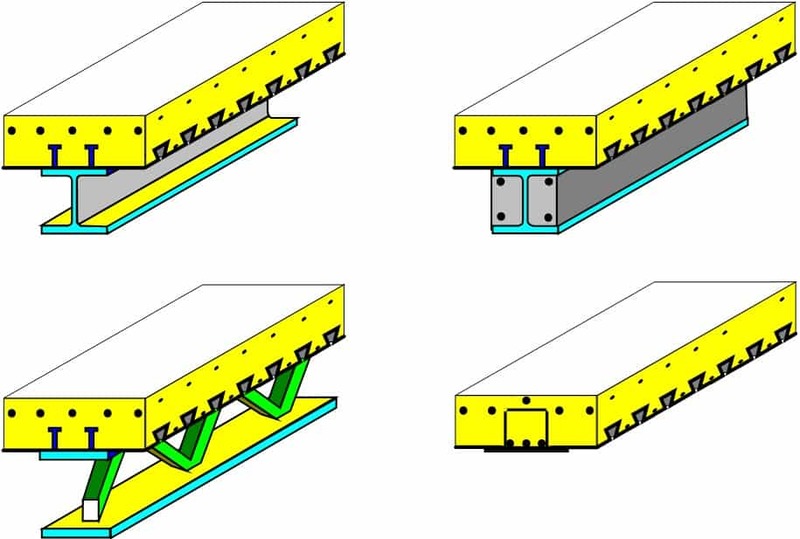 most common type of shear connector used in composite beams for buildings is a 19 mm diameter by either 100 mm or 125 mm long welded stud. The property of shear connector most relevant to design is the relation-ship between the shear force transmitted, P, and the slip at the interface, s This load-slip curve should ideally be found from tests on composite beams.